Greenville’s Bailey Hartle runs during the Division I boys 4×800 meter relay on Friday at Ohio State’s Jesse Owens Memorial Stadium in Columbus. Greenville’s Sam Harper runs during the Division I boys 4×800 meter relay on Friday at Ohio State’s Jesse Owens Memorial Stadium in Columbus. Greenville’s Jacob Butsch runs during the Division I boys 4×800 meter relay on Friday at Ohio State’s Jesse Owens Memorial Stadium in Columbus. Greenville’s Aaron Balsbaugh runs during the Division I boys 4×800 meter relay on Friday at Ohio State’s Jesse Owens Memorial Stadium in Columbus. Arcanum’s Erica Zimmer competes in the Division III girls shot put competition on Friday at Ohio State’s Jesse Owens Memorial Stadium in Columbus. Franklin Monroe’s Nicole Berry competes in the Division III girls shot put competition on Friday at Ohio State’s Jesse Owens Memorial Stadium in Columbus. Ansonia’s Heath Barga carries his disc during the Division III boys discus throw competition on Friday at Ohio State’s Jesse Owens Memorial Stadium in Columbus. Versailles’ Trevor Noggle runs during the Division III boys 4×800 meter relay on Friday at Ohio State’s Jesse Owens Memorial Stadium in Columbus. Versailles’ Noah Pleiman runs during the Division III boys 4×800 meter relay on Friday at Ohio State’s Jesse Owens Memorial Stadium in Columbus. Versailles’ Mitchell Paulus runs during the Division III boys 4×800 meter relay on Friday at Ohio State’s Jesse Owens Memorial Stadium in Columbus. Versailles’ Richie Ware runs during the Division III boys 4×800 meter relay on Friday at Ohio State’s Jesse Owens Memorial Stadium in Columbus. Versailles’ Josh Steinbrunner runs during the Division III boys 110 meter hurdles on Friday at Ohio State’s Jesse Owens Memorial Stadium in Columbus. Versailles’ Taylor Winner runs during the Division II girls 4×800 meter relay on Friday at Ohio State’s Jesse Owens Memorial Stadium in Columbus. Versailles’ Emily Langenkamp runs during the Division II girls 4×800 meter relay on Friday at Ohio State’s Jesse Owens Memorial Stadium in Columbus. Versailles’ Murphy Grow runs during the Division II girls 4×800 meter relay on Friday at Ohio State’s Jesse Owens Memorial Stadium in Columbus. Versailles’ Madison Grilliot runs during the Division II girls 4×800 meter relay on Friday at Ohio State’s Jesse Owens Memorial Stadium in Columbus. Versailles’ Cassie Peters takes the handoff from Haley Winner in the Division II girls 4×200 meter relay on Friday at Ohio State’s Jesse Owens Memorial Stadium in Columbus. Versailles’ Camille Watren takes the handoff from Taylor Winner in the Division II girls 4×200 meter relay on Friday at Ohio State’s Jesse Owens Memorial Stadium in Columbus. Versailles’ Valerie Francis runs during the Division II girls 4×100 meter relay on Friday at Ohio State’s Jesse Owens Memorial Stadium in Columbus. Versailles’ Camille Watren runs during the Division II girls 400 meter dash on Friday at Ohio State’s Jesse Owens Memorial Stadium in Columbus. Ansonia’s Lydia Sink clears the bar in the Division III girls high jump on Friday at Ohio State’s Jesse Owens Memorial Stadium in Columbus. Versailles’ Haley Winner runs during the Division II girls 4×400 meter relay on Friday at Ohio State’s Jesse Owens Memorial Stadium in Columbus. COLUMBUS – Athletes from Ansonia, Arcanum, Franklin Monroe, Greenville and Versailles competed at the Ohio High School Athletic Association state track and field meet on Friday at Ohio State’s Jesse Owens Memorial Stadium in Columbus. 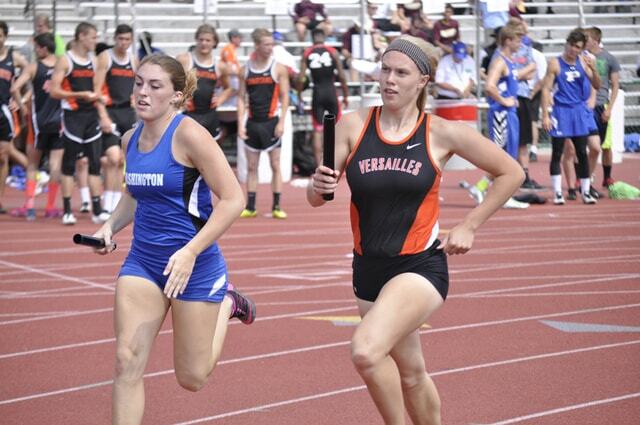 Versailles turned in Darke County’s best performance of day one of the state track and field meet Friday as the Lady Tigers finished sixth with a time of 4:03.80 in the Division II girls 4×400 meter relay. The sixth place finish for the quartet of junior Haley Winner, freshman Kayley Ruschau, senior Taylor Winner and sophomore Camille Watren earned them one of nine spots in Saturday’s state championship race. In other results, Greenville’s quartet of seniors Bailey Hartle, Sam Harper, Jacob Butsch and Aaron Balsbaugh finished 14th in the Division I boys 4×800 meter relay with a time of 8:08.24. The Green Wave faced adversity early in the race as their lead runner, Hartle, was bumped and stepped on the inside rail of the track, causing him to fall. While the result was disappointing, the Greenville runners enjoyed getting to run at the state meet. And with all four Greenville runners being seniors, they had the opportunity to end their high school careers on the biggest stage in Ohio. Franklin Monroe sophomore Nicole Berry placed 11th with a throw of 37 feet 1.5 inches and Arcanum junior Erica Zimmer placed 13th with a throw of 36 feet 8 inches in the Division III girls shot put. Ansonia sophomore Lydia Sink placed 12th in the Division III girls high jump with a jump of 5 feet 2 inches, tying her personal best mark. Ansonia sophomore Heath Barga placed 15th in the Division III boys discus with a throw of 138 feet 8 inches. Versailles freshman Josh Steinbrunner finished 10th in the preliminaries of the Division III boys 110 meter hurdles. In his first trip to the state meet, his time of 15.39 was just 0.05 off qualifying for finals. Versailles’ squad of Haley Winner, freshman Cassie Peters, Taylor Winner and Watren finished 10th in the preliminaries of the Division girls II 4×200 meter relay in a time of 1:45.39. Versailles’ Watren finished 11th in the preliminaries of the Division II girls 400 meter dash with a time of 59.91. Versailles’ team of Peters, Taylor Winner, senior Valerie Francis and Haley Winner finished 12th in the preliminaries of the Division II girls 4×100 meter relay with a time of 50.34. It was really fun and exciting to compete at state, Peters said. Versailles’ quartet of freshman Trevor Noggle, sophomore Noah Pleiman, sophomore Mitchell Paulus and senior Richie Ware finished 13th in the Division III boys 4×800 meter relay. The Versailles boys finished the 4×800 meter race with a time of 8:19.01. It was a goal all season for the Tigers to make it to state in the relay, Pleiman said, and he was thankful the coaches had them peaking last week so they could run well at the regionals and advance to the state meet. With three of the relay members being underclassmen and experiencing the state meet for the first time, they were happy to gain the experience and think it will help them later on in their careers. Versailles’ team of Taylor Winner, sophomore Emily Langenkamp, senior Murphy Grow and junior Madison Grilliot finished 16th in the Division II girls 4×800 meter relay. The Versailles girls finished the race in 9:59.95. For Grow, the 4×800 meter relay race marked the end of her high school career. She was proud to represent Versailles at state in her final meet, she said.